Most of you ladies would be aware of pregnancy tests, as well as pregnancy test-kits, a number of which are in the market. But, have you ever heard of the hCG pregnancy test? Before we go any further, let’s learn about the common pregnancy tests. First trimester screening is an amalgum of fetal ultrasound and maternal blood tests that are performed during the first trimester of pregnancy. This test process can help to determine the risk of the fetus having certain birth defects. The Nuchal translucency screening uses an ultrasound test to examine the area at the back of the fetal neck for increased fluid or thickening. Pregnancy-associated plasma protein screening (PAPP-A):This is a protein produced by the placenta in early pregnancy. Unusual levels are associated with an increased risk forchromosome abnormality. Human chorionic gonadotropin (hCG):This is a hormone produced by the placenta in the early stages of pregnancy. Abnormal levels are associated with an increased risk for chromosome abnormality. What is the human chorionic gonadotropin (hCG) blood test? Human chorionic gonadotropin – or hCG – is commonly called the “pregnancy hormone”. Most women, trying to get pregnant and who have taken more than a few pregnancy tests already know that hCG is the hormone that is detectable by pregnancy test kits or by hCG blood tests. The purpose of this article is to impart knowledge about hCG, its purpose, and how fast hCG increases in a pregnant woman’s system. The cells in the placenta make human chorionic gonadotropin, or hCG. The placenta is the sac that nourishes the egg after it’s fertilized and attaches to the uterine wall. 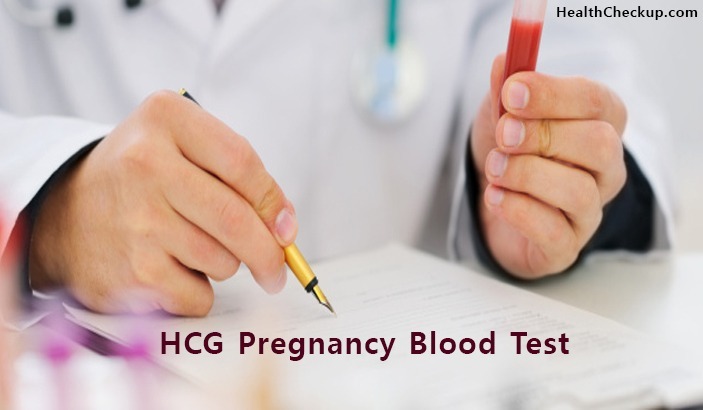 The HCG can first be detected in a blood sample about 11 days after conception. The levels of hCG continue to double every 72 hours, and they reach their peak around 8 to 11 weeks after conception. The HCG levels then start declining and level off, and remain steady for the rest of your pregnancy. Why Is the Quantitative hCG Blood Test Performed? In some cases, the hCG hormone test is used to screen for pregnancy before a woman undergoes certain medical treatments, such as X-rays, that could potentially harm a developing baby. The blood test is a normal procedure that is conducted before undergoing one of these procedures to make doubly sure that you are not pregnant. This ensures that you are protected and that the fetus isn’t injured by the procedure. How Is the hCG Pregnancy Test Performed? An elastic band is wrapped around your upper arm to stop the blood flow and to make the veins in your arm more visible so that the needle can be inserted easily. A vein is located and the skin around the vein is cleaned with alcohol or spirit. The needle is inserted into the vein and a tube is attached to the end of the needle to collect the blood. After the requisite quantity of blood is collected, the elastic band is removed from your arm. After the needle is removed, cotton, gauze, or a plaster is placed onto the puncture site. What are the risks that are associated with the hCG Pregnancy Test? There are little or no risks involved with the hcg pregnancy test. There may be a small amount of bruising where the needle was inserted, which can be minimized by applying pressure to the area for several minutes after the needle is removed. How do you understand the hCG Quantitative Test Results? When your hcg pregnancy blood test results comes back, your doctor will explain to you what your hCG levels are. These levels are measured in Milli-international units of hCG hormone per milliliter of blood (mIU/ml). Normal hCG levels in non-pregnant women are less than 5.0 mIU/ml, and in postmenopausal women normal levels are less than 9.5 mIU/ml. If your hCG levels are outside of the normal range, it could mean a number of things. Your doctor will explain the results to you. Are the hcg pregnancy test results always accurate? It is common knowledge that no test is 100 percent accurate every time. The hCG test can give both false-negative results and false-positive results for pregnancy. Your doctor will help you figure out your results or do follow-up testing if there is any doubt. If the hCG test comes back negative, it normally means that you’re not pregnant. But, if the test was done too early in the pregnancy, before your body has produced enough hCG, you can get a false negative result. As the hCG levels change quickly during early pregnancy, the hCG quantitative test should be repeated within 48 to 72 hours to observe how the hormone level changes. Blood samples that have protein, blood, or excess pituitary gonadotropin in them can cause a false-positive hCG test. It is also possible to get a false-positive result if your body produces certain types of antibodies that have fragments of the hCG molecule.